A warm welcome to our newest locations! Buckeye, Boehmer and Tom’s! This year we’ve spread our reach across the country, allowing us to help serve even more customers with three new locations joining our network! Buckeye Heating and Cooling joins us from Columbus, Ohio. 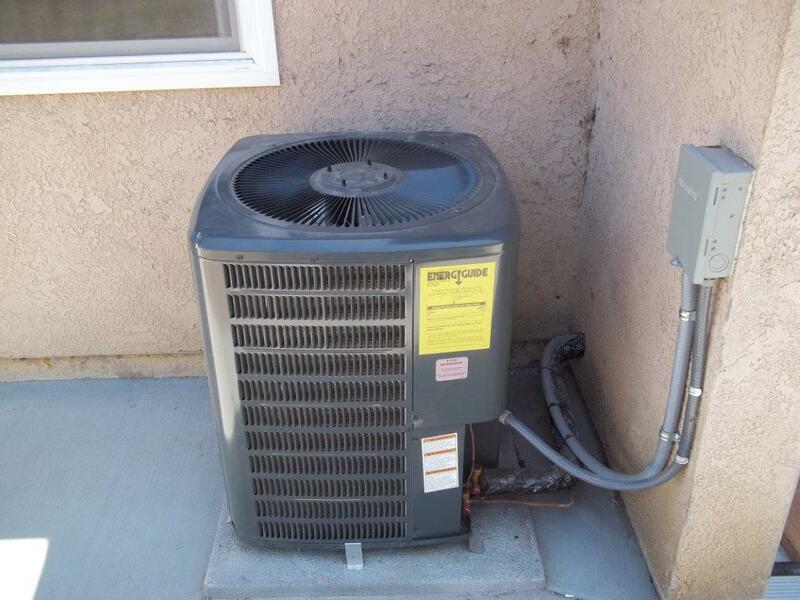 “We are thrilled to be a part of the GreenHomes organization,” said Brad Wentz, President of Buckeye Heating & Cooling. “We are proud to be able to offer Home Performance services to the Columbus region and provide homeowners with solutions to help lower energy bills and improve overall comfort and safety in their homes.” It is great to have them on board! GreenHomes America looks forward to assisting our latest locations help homeowners improve their homes, making them safer, more efficient and comfortable in the process. I encourage you to reach out them and see how they can help you! Equipment: Reach for the stars! I’ve been talking about the demonstration home at one of our locations lately, and ASI installed some great upgrades including a high efficiency water heater and HVAC system, Energy star appliances, and LED lighting. We’ve discussed many of these things in the past because they make sense, especially when electric rates can be high. It’s a great idea to reduce the wattage of lights but who wants to read in the dark? Lighting is like comfort, you don’t need to compromise in order to be more efficient. When it comes to lighting, Lower wattage CFL’s and LED’s allow us the best of both worlds just like high efficiency equipment. As an added bonus, the LED lighting that we install has a life of over 50,000 hours. That’s a lifetime for most people. 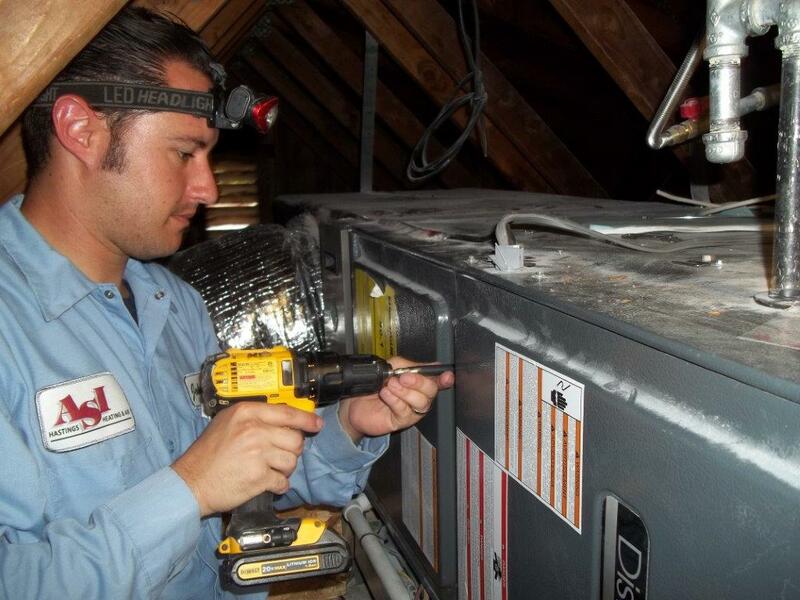 They say HVAC is the heart of home performance and good equipment goes hand and hand with good buildings, these are stars that are both within your reach. Carbon Monoxide: Be Afraid, Take Action! We’ve posted about CO in the past. It comes up in the news too often, and it is something we should all be concerned about. A case in Aspen, Colorado is moving to trial following the death of a family due to carbon monoxide poisoning. The Aspen Daily News reported that According to the lawsuit, the boiler’s exhaust piping was disconnected, because it had been “neither properly primed, glued or sealed and was not securely attached, supported or braced in any way.” They also found that the vent to pull fresh air in was not connected to the outside so it only recirculated CO in the home. This seems like gross negligence, and the reason why installers need to be certified, as well as why codes are in place. Even with this, systems fail when they are not maintained. Install a CO monitor and check it annually much like a smoke detector. Have your combustion appliances checked regularly. Regular HVAC service calls are important. Even better have a BPI certified auditor assess your home. It is part of a very thorough inspection of not only water heaters, furnaces and boilers, but also gas ovens and fireplaces, some things HVAC technicians may not normally inspect. Spring time! New Siding, New Windows, New Extreme Retrofit? 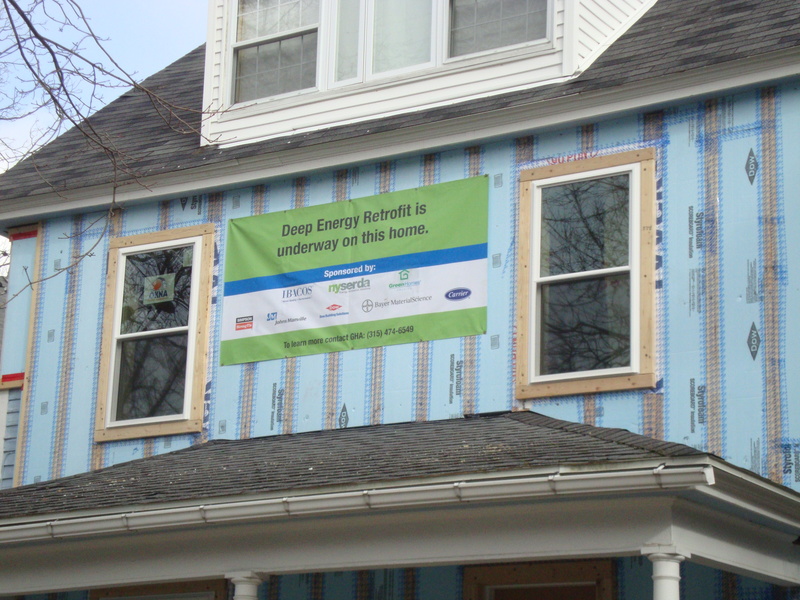 Winter is past and we are gearing up for round two of our exterior insulation Deep Energy Retrofit project in New York. there was a feature in the NEWS , check it out! 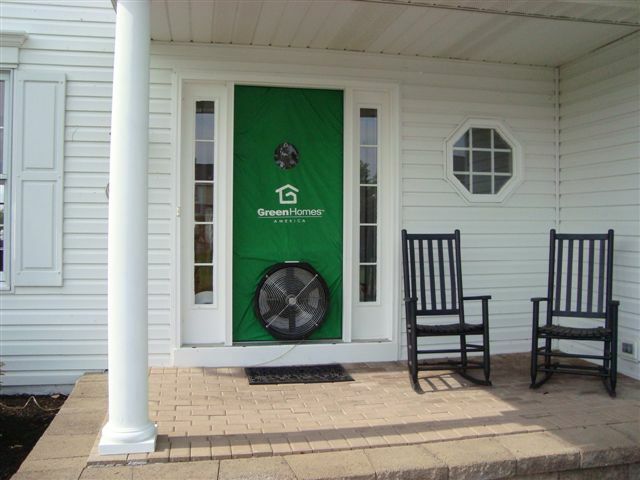 As the weather gets nicer, we often consider new siding and new windows, it also may be time to consider new insulation. Any time is a good time to improve R values and reduce air leaks. If going extreme is not what you are prepared to do with a full exterior retrofit, consider that if siding is being replaced it is a great time to blow in dense packed fiber insulation. Welcome Gundlach’s! New to GreenHomes but 100 years in Business! It is an honor and a pleasure to welcome our latest partner Gundlach’s Plumbing & Sheet Metal to the GreenHomes America network where we can truly help fulfill their statement, “today’s technology with good old fashioned integrity.” It is great to see our network grow in Southern California, with this new location in Bakersfield. Gundlach’s is a plumbing, heating, ventilation and air conditioning service provider, originating in 1900 as a plumbing repair shop. They also provide remodeling services for bathrooms and kitchens; becoming a GreenHomes America partner, they will now include home energy retrofits, allowing homeowners to dramatically improve their home’s energy efficiency and comfort levels. Ken Wonderly, Owner of Gundlach’s says “We feel that the home energy retrofit market is going to grow substantially over the next few years and we are very excited to be part of it”. Too true, I can see it growing already. Welcome aboard! A recent study this summer from UC Berkeley and UCLA looked at homes that were certified as green from a few different organizations. Although the certification standards varied, the homes needed to have details such as well-insulated ceilings and walls and energy-efficient lighting. These are just some of the basics of making a home “green”, as well as efficient appliances, proper HVAC equipment and good indoor air quality. These things unfortunately don’t always happen in new homes, even those with the green label. However, they can and should happen in every home, and that’s why we do what we do. This study comes from a state with a very nice incentive system in place for energy efficiency retrofits. Energy upgrade California is a good place to start if you are a resident of CA. For residents of other states, you can find some incentive programs from DSIRE. The full study can be found here. You can also contact one of our locations to learn more about how you can make your home safer, energy efficient, more valuable, and of course, green! Our Home Performance technicians see some scary stuff out in the field, like giant wasps’ nests, creepy crawl spaces and immense icicles. But arguably the scariest of them all is the dreaded duct tape monstrosity! Often found lurking in basements and attics clinging to heating and cooling ducts, these efficiency eaters can range in size anywhere from a single stitch to multiple rolls. 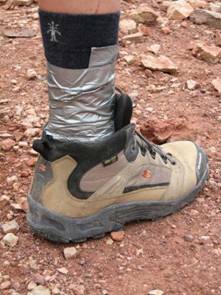 This may seem crazy, but your standard cloth duct tape can and should be used to patch or repair virtually anything – except for ducts! These tapes just aren’t suitable for patching, repairing, or securing heating and cooling ducts. These tapes quickly deteriorate—sometimes within just a few months. They come unglued and allow air to leak in and out of your ducts, thereby letting your heated or cooler air to escape before its final destination. Yet, time and time again we see these silver-backed creatures in homes all across the county. Real HVAC professionals use mastic, a goopy white paste that has the consistency of peanut butter (we do NOT want to know what it tastes like!). Do you have a duct tape monstrosity living in your house? A cobbled-together contraption, with failing joints and seams? Have you seen one while out on the job? We want to see it! Have you used duct tape to fix your brother’s broken-down car? 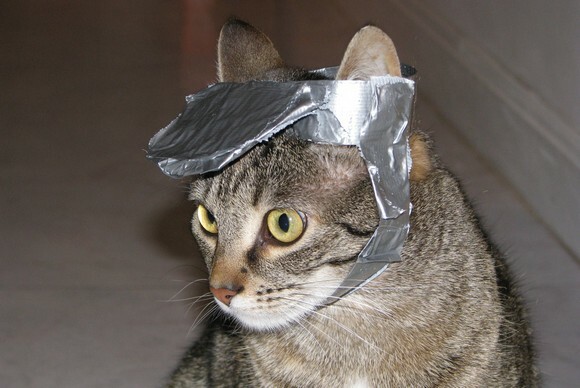 Is your private spaceship made out of 36% duct tape? Your daughter’s prom dress? We want to see those pictures too! 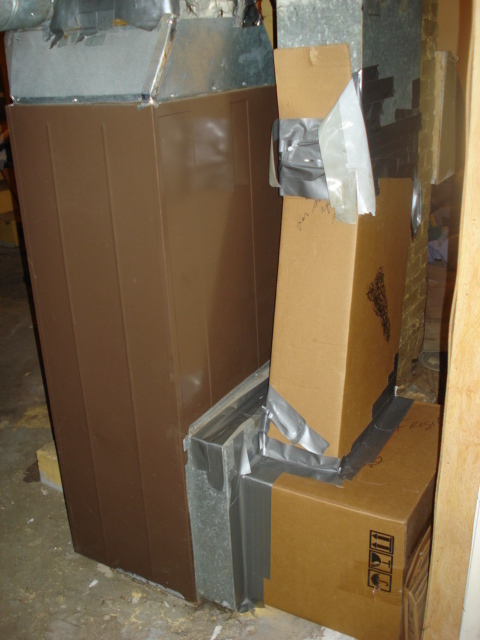 Best example of inappropriate duct tape use on an HVAC system. Most creative use of duct tape – anywhere, on anything (keeping in mind this is a family program)! Post your photo to our Facebook page wall by May 31 at 3 p.m. Eastern. We will announce the winners on Facebook and here on our blog. This contest has now ended! For the bad duct-sealing example winner, a tub of mastic and a home energy-efficiency grab bag gift*. For the creative-use winner, one large roll of duct tape (of course!) To be used for anything BUT your home’s ducts. And a home energy-efficiency grab bag gift*. *Retail value of the grab bag not to exceed two twenty-dollar bills duct-taped together. Not exchangeable, not redeemable for cash, and definitely not to be taken internally! Open only to residents of the U.S. and Canada. GreenHomes employees, affiliates, vendors, their families, and pets are not eligible for the prizes—but we like seeing your pictures, too, so feel free to post them! Be creative, but please don't harm your pets! Here’s an example of green jobs in action. Real jobs, great benefits, and a chance to help improve out energy independence and save the planet one home at a time. Visit the GreenHomes website to learn more about specific openings and locations. Thanks for the great feedback from many of you on the article on “Home Performance Contracting” in the September 2009 issue of the Journal of Light Construction. For those of you who haven’t had the chance to read it, it’s available on the GreenHomes website. And contractors lurking out there, you should also consider subscribing to JLC—one of the best periodicals to follow to stay on top of developments in the residential and light commercial contracting sectors. Reading the McKinsey energy efficiency report again over the weekend I noted that one of the solution strategies cited (p.39 of the report) Home Performance with ENERGY STAR, the Building Performance Institutie (BPI) ,and the promotion of home performance solutions such as those of the heart of the GreenHomes approach. They call out the need for proper sizing of HVAC equipment and duct sealing—things you’ve seen mentioned here. The report mentions a lot of barriers. Including education, contractor capacity, and financing. But we address all of these on a daily basis. So I’m encouraged because we see it working for our customers every day—and it means it really is possible on a broader scale.